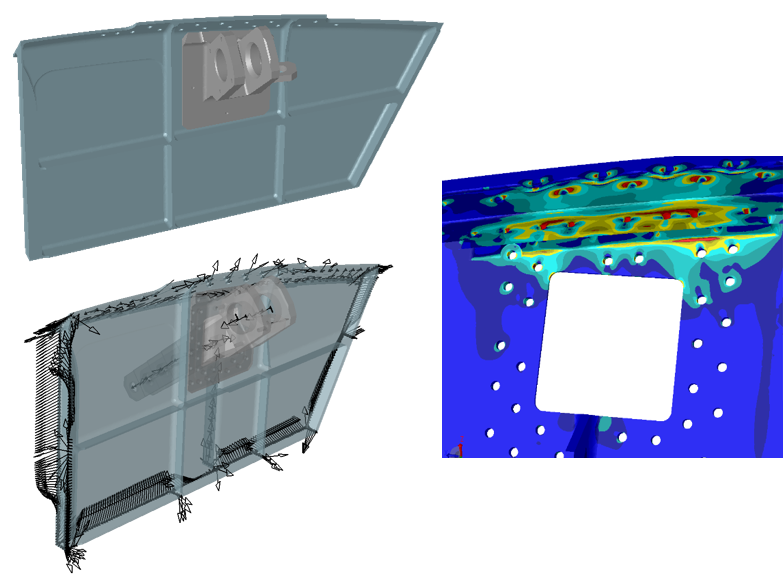 StressCheck Professional | ESRD | Engineering Software Research and Development, Inc.
From the perspective of engineering leadership, StressCheck® Professional is the only FEA tool that supports Simulation Governance. 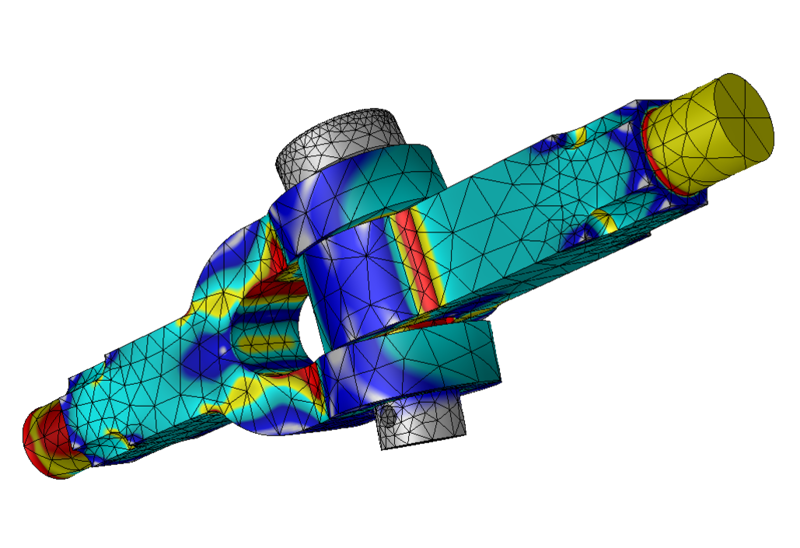 From the perspective of analysts, StressCheck® Professional is the only FEA tool that supports solution verification in practical engineering settings. From the perspective of designers, StressCheck® Professional provides a framework for standardization of routine design procedures with guaranteed reliability. StressCheck® Professional is for engineers serious about getting the right answer. 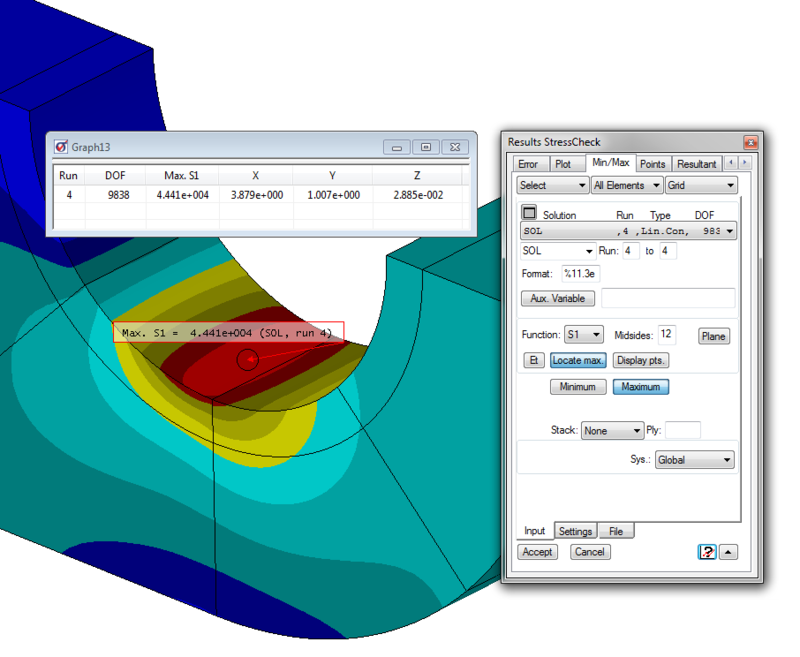 StressCheck® Professional is a comprehensive Windows 10-compatible, 64-bit finite element analysis software (FEA) tool with a fully integrated pre- and post-processor (StressCheck® Core) and a suite of solver and analysis modules that support advanced engineering computations in applications of solid mechanics. 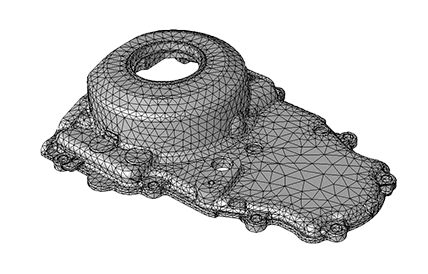 Productivity tools are available to import NASTRAN bulk data file meshes and CAD geometry, perform 2D and 3D automatic meshing, automate analyses via StressCheck®‘s API, and more. StressCheck® Professional provides industry-leading live dynamic results processing options which include error estimators for the assessment of the quality of model approximation: global error estimation in energy norm and local error estimators for any engineering function of interest. 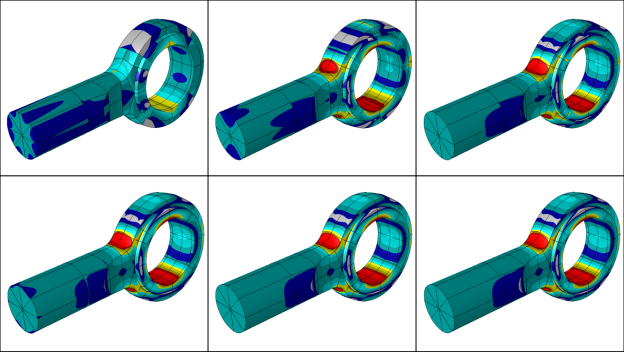 Additionally, live extractions of stresses, strains and even combinations of engineering functions can be made anywhere in the model, at any time, at any resolution. What does this all mean? 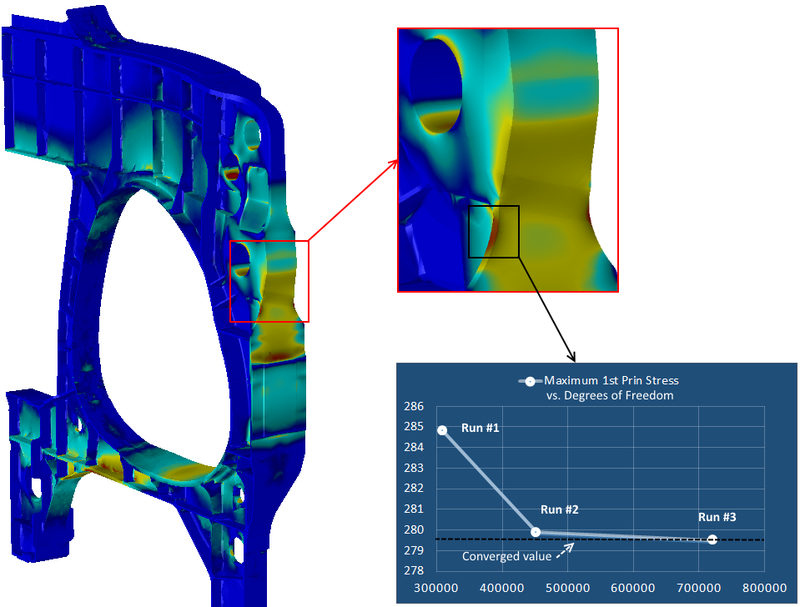 Users need not spend excess time on meshing the model according to traditional FEA schema or planning ahead for myriad post-processing needs; StressCheck®‘s implementation provides the flexibility to account for changing requirements in engineering analysis results, all within the same model and mesh. Why Switch to StressCheck® Professional? 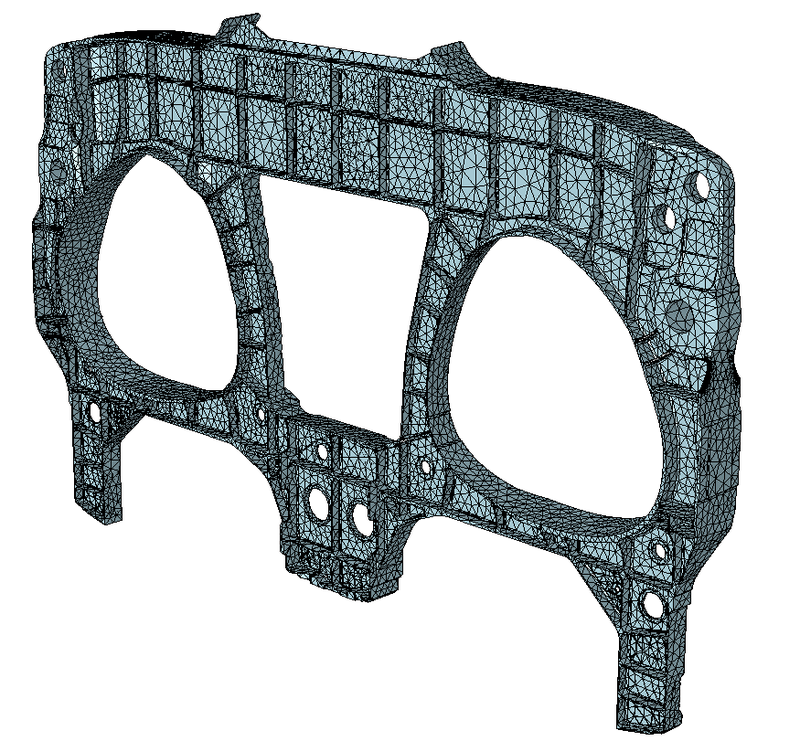 Simple: Focus on your simulation requirements, and not costly decisions like selecting the “right” element types, using the “best” element size or designing meshes around post-processing areas of interest. Engineers should be doing engineering, not worrying about the mesh. Accurate: StressCheck® has built-in capabilities to automatically report solution accuracy, helping you make intelligent engineering decisions. 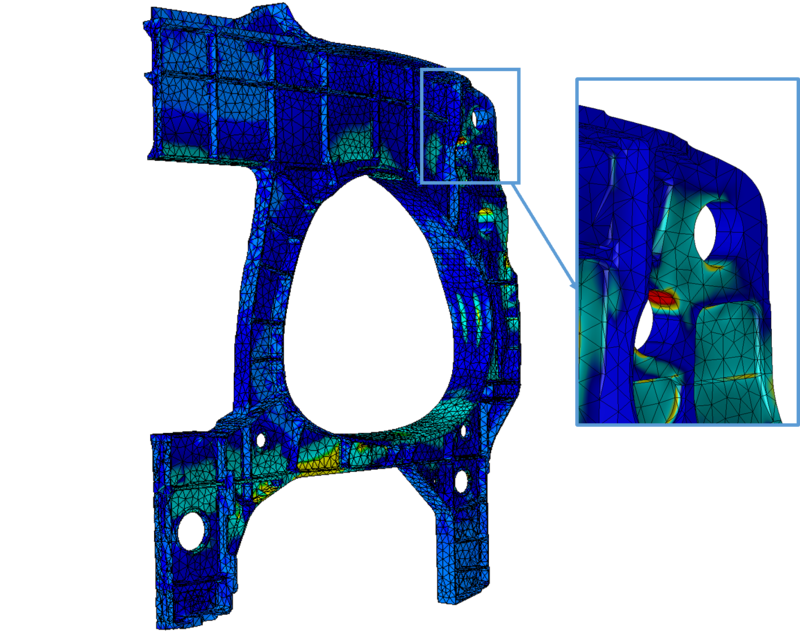 Fast: How long does it take to import a CAD file, mesh, apply boundary conditions, solve and assess the quality of the solution for any quantity, anywhere, at any resolution? You’ll be pleasantly surprised with StressCheck®. Let us show you via a presentation/demonstration. Efficient: The elite combination of model setup, hierarchical solutions, on-demand results and built-in error feedback makes StressCheck® the leader of the pack in overall efficiency. Reliable: For a given model StressCheck® will report the associated error of approximation for any result of interest. 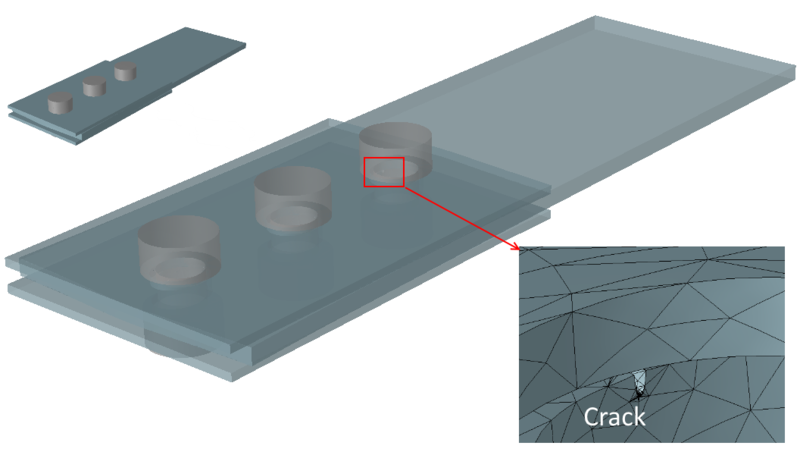 StressCheck® separates modeling errors from approximation errors, making it the most reliable FEA software in the market. Simple, Accurate, Fast, Efficient & Reliable. 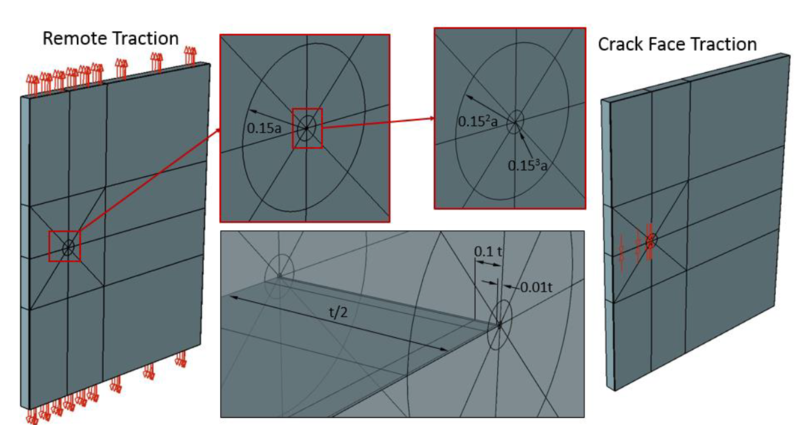 Allows for elements with very large aspect ratios (200:1 or larger) which is essential for the ply-by-ply modeling of laminate composites and bonded composite joints. 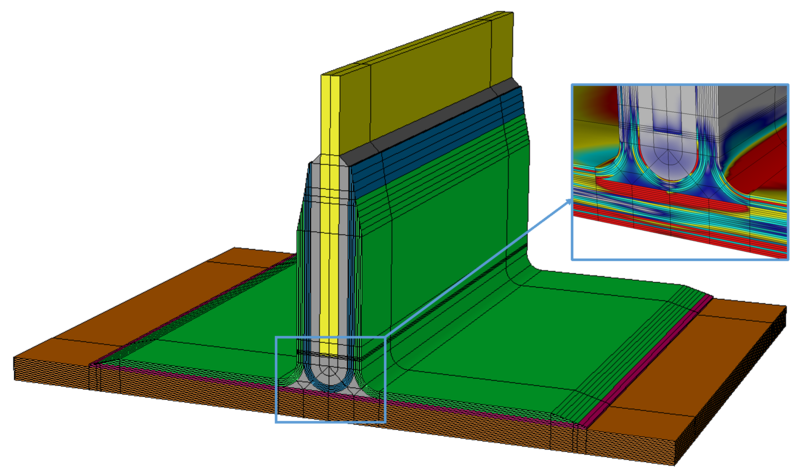 Elements are not susceptible to shear locking, “hourglassing”, “overstiffening” or other problems that plague FEA users. 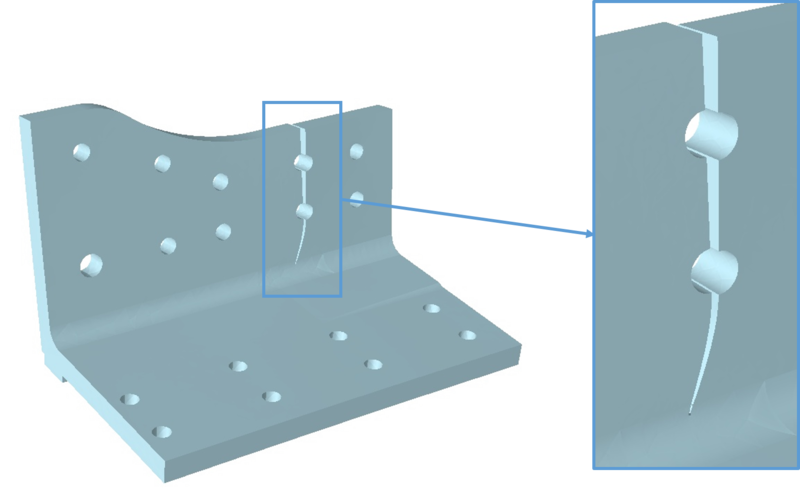 Makes it possible for the elements to accurately represent the shape of the part which is extremely valuable for accurate stress analysis of single parts and for multi-body contact situations such as multi-fastened joints. 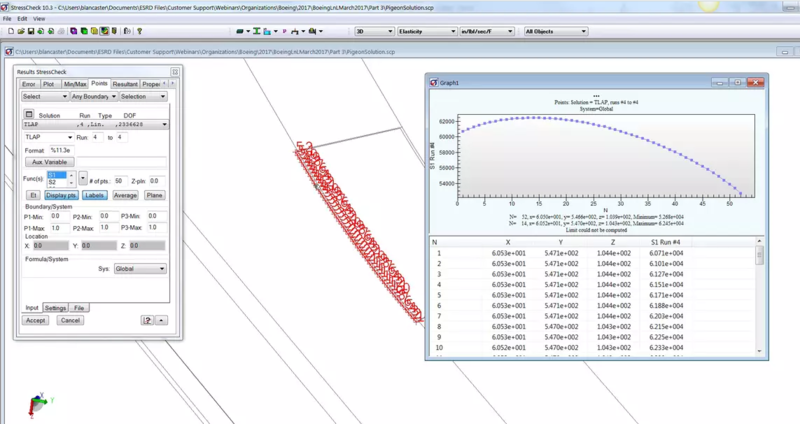 Allows for a nonlinear analysis to be continued from a linear analysis, or to switch from linear elastic to buckling. From global models are available for global-local stress analysis. 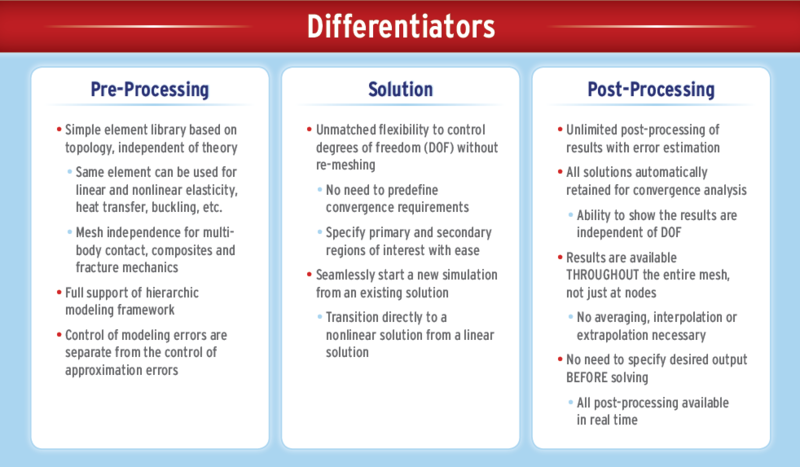 Allows analysts to extract any data from the FE solution and assess the convergence of the results. Results are not limited to nodes, as the solution is available everywhere in the model (mesh-independent). 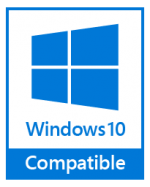 For deployment of standard solutions with confirmation of reliability. This allows users the ability to create a library of parametric models to serve as repository for standardization and corporate design knowledge. FE-based handbook solutions eliminate the need of overly simplified assumptions typical of closed-form solutions found in classical handbooks, and can be customized to accurately describe real world problems. 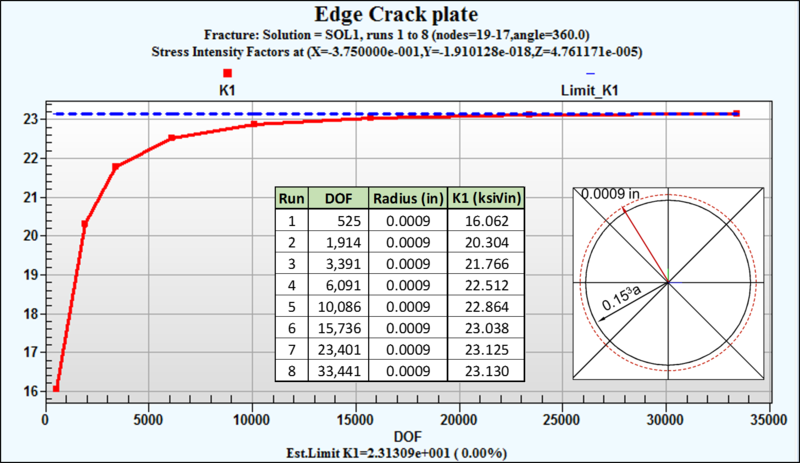 Via highly reliable and efficient procedures: Stress intensity factors for through and corner cracks in isotropic materials and energy release rate components for cracks and delamination in composite materials. Keep up to date on the latest StressCheck® Professional updates and enhancements.